Adams made his Major League debut with the Cubs on September 18, 1922. He played 11 games during the 1922 Chicago Cubs season. He spent the following two seasons as the team’s shortstop, splitting time at the position with Charlie Hollocher. In the 1923 Chicago Cubs season, he hit four home runs in 311 at-bats for the season, then went on to hit only five the following 5,246 at-bats of his career. The 1925 Chicago Cubs season became his breakthrough, as he became a second baseman as a result of a trade that sent George Grantham to Pittsburgh, leaving the second base position open. As a hitter, he finished the season with 26 stolen bases, eight triples, and 627 at-bats, which led the National League. As a fielder, he led all second basemen in putouts, assists, and fielding average for the season. In 1926, Adams increased his batting average to .309, and stole a career-high 27 bases, second-best in the National League. He also played all 154 games of the season, finished first in at-bats for the second year in a row with 624, and finished first in plate appearances with 700. The 1927 Chicago Cubs season saw Adams being used mainly as a utility infielder, although he started nearly every game. He played 60 games at second base, 53 at third base, and 40 at shortstop. He led the league in at-bats for the third year in a row with 647, and stole 26 bases for the third year in a row. The 1927 season marked the end of Adams’ time in Chicago. On November 28, 1927, Adams was traded along with Pete Scott to the Pittsburgh Pirates for Kiki Cuyler. Manager Joe McCarthy was criticized for the move, as the Cubs has plenty of outfield strength, but lacked a solid infield presence. It was also considered a good move for Pittsburgh, with sportswriters picking the Pirates to finish first the National League in 1928. 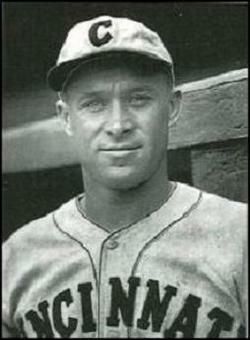 He was given the starting second baseman job for the 1928 Pittsburgh Pirates season. He took the place of George Grantham, so was moved to first base, the second time that Adams forced Grantham to another infield position. However, his batting average began to decline, and by the 1929 Pittsburgh Pirates season, he was being used as a utility infielder. At the end of the season, the St. Louis Cardinals purchased his contract from the Pirates after two seasons of playing in Pittsburgh. 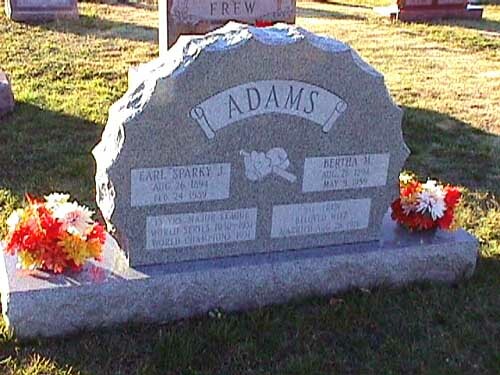 As the 1930 St. Louis Cardinals season began, Adams was given the starting third baseman job. He went on to have a career high batting average of .314, and hit a career high nine triples. He played all six games in the 1930 World Series, hitting .143 as the Cardinals ended up losing the series. That season, every single Cardinals player with over 300 at-bats had a batting average over .300, the only time in history this has happened. The 1931 St. Louis Cardinals season ended up being a career year for him. He was first in the league in doubles with 46, and had over 600 at-bats for the fourth season. He also placed in MVP voting, finishing ninth with 18 votes. He played 143 games over the season, however, an injury in September caused him to miss postseason time. He was injured on September 20 when, after winning a bunting and running contest before the game, sprained his ankle while taking part in the baserunning challenge. He played two games as the Cardinals won the 1931 World Series. The following season, he only played 31 games due to injury. On May 7, 1933, Adams was traded along with Paul Derringer and Allyn Stout to the Cincinnati Reds for Leo Durocher, Dutch Henry, and Jack Ogden, after playing only eight games for the Cardinals that season. He became the starting leadoff man during the 1933 Cincinnati Reds season, as he had been for the other teams he played for. During the 1934 Cincinnati Reds season, he was primarily a backup to Mark Koenig, was used as the backup second baseman and third baseman. At the end of the season, Adams was released, and he retired at the end of the 1935 season. After his retirement, he became a farmer and a service station operator in Tremont, Pennsylvania. 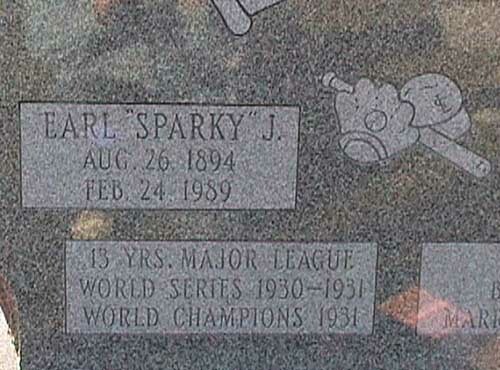 When he died in Pottsville, Pennsylvania on February 24, 1989, he was the last remaining player for the St. Louis Cardinals in the 1931 World Series. When he retired after the 1934 season he had career totals of 1,424 Games Played, 1,588 Hits, 844 Runs, 394 Runs Batted In, 9 Home Runs, and a career .286 Batting Average.